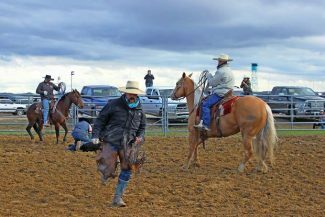 Horses, cattle and cowboys left deep tracks in the mud of Gillette's CamPlex arenas during the Wyo Wild Ride and qualifying event approved by the Western States Ranch Rodeo Association (WSSRA) on Saturday, May 23. Kicking off at 10 a.m., the event showcased 13 Men's Teams and 9 Women's Teams in the events Sort & Doctor, Head & Heel Tiedown Roping, Trailer Loading, and Head & Heel Branding; plus 18 cowboys in Stock Saddle Bronc Riding and a flock of quick roping cowgirls in Women's Steer Stopping. The colorful contestants – representing South Dakota, Montana, Idaho, Nebraska, Colorado and Wyoming – hailed from ranches with widely spaced zip codes sprinkled across the broad cattle ranges of the West. Planned, promoted and produced by Tiffany Schwenke of North Four Mile Creek Horse Ranch, the event was well-attended in spite of chilly, near-rain conditions borne on Wyoming's tireless wind. Tiffany's family has been breeding and selling good horses for more than a century and the heritage, values and traditions of working ranches are near and dear to her heart. 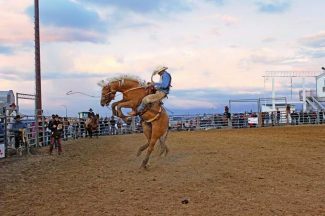 She chose to produce a WSSRA event because the association gives working men and women who are not full time ranch hands the opportunity to enjoy Ranch Rodeo competition and display their skills, even though they may hold down regular jobs outside of ranching and only cowboy for wages on their day's off. Through opening Ranch Rodeo doors to such people, WSSRA explains they "considerably enrich the ranch rodeo sport, bringing in fresh talent, showcasing more skills and encouraging seniors, women and youths to participate in a family atmosphere." WSSRA representatives Naomi Loomis from Nebraska and Justin Quint from Colorado were in Gillette to assist with the production. Qualifying contestants are now eligible to participate in the 2015 WSSRA Finals at Winnemucca, Nevada. The WSSRA National Sponsors (see story online for a full list) – to bring this WSSRA National Qualifier event to Gillette, Wyoming. Along with wild arena action, spectators enjoyed food and drink vendors and a Trade Show, organized and managed by Darcy Hanson of The Copper Sun, in the Grandstand area. Experienced rodeo judges Tom Wagoner of http://www.stopwatchhorses.com and Kevin Meyer of http://www.mantzcreekhorses.com interpreted and enforced the myriad rules of so many multifaceted events. Pickup men Wade Kornemann, Brett Marshall, Jake Gill and Toby Vineyard were well-mounted and quick to rescue the bronc riders at the end of each eight second ride. Broncs were provided by Burch Rodeo Company, roping steers by Larry Steele of Steele Cattle and calves by Kurt Kinghorn. Longtime Wyoming ranchers Kendall Cox of Rozet and Rhonda Sedgwick Stearns of Newcastle shared the microphone to call the rodeo action. Marilyn Mackey managed the secretarial tasks and timers were Betty Hough, Brittany Bucholz, and Laurie Cox. 4 Jessie Konoske, Buffalo, Wyoming. 4 Powder River Girls – Amy Gonzales and Jessie Konoske, Buffalo, Wyoming; Amy Vineyard and Valee Cooley, Arvada, Wyoming. 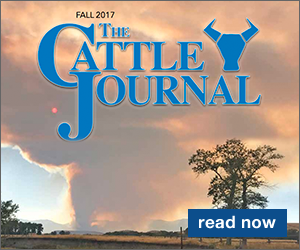 1 MW Ranch, Levi Walker and Layne Craften, Kemmerer, Wyoming; Chad Rainsdon, Dillon, Montana; Mike McArthur, Deer Lodge, Montana. 2 Slim Butte Boys – Clint Doll, Ty Thyco, Ty Hotchkiss and Jay Olson, Prairie City, South Dakota. 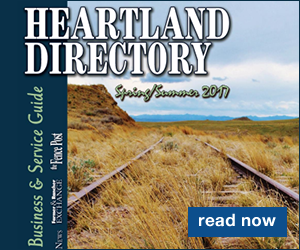 3 Floyd Land & Livestock – Wade Kornemann and Brett Marshall, Lodge Grass, Montana; Blaine Humble and Kirk Lohof, Gillette, Wyoming. 4 Padlock Ranch – Matt Noyes, J.D. Hill, Cody Snyder and Ben Monk; Big Horn, Montana. 4 Brandon Bowwers, Sheridan, Wyoming. A lot of spooky, ambitious sheep provided wild rides for a long line of small but eager mutton busters. Champion was Gabbi Bolli, with Bronc Vineyard claiming second, Raynee Jones third and Brady Maher fourth. Founder/Producer Tiffany Schwenke said she hopes to host this event again next year, adding a second day featuring the sale of participating horses. No other nearby horse sales are scheduled at that time of year.